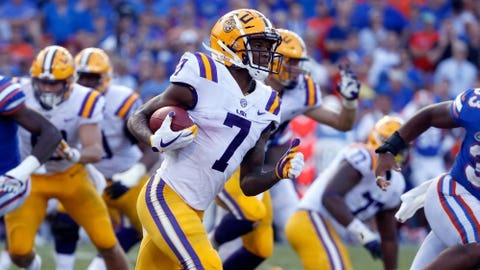 JACKSONVILLE, Fla. (AP) — The Jacksonville Jaguars have signed rookie receiver DJ Chark to a four-year contract worth about $4.5 million. A second-round draft pick from LSU, Chark was slotted to get a $1.3 million signing bonus. He was the 61st overall selection. The 6-foot-4 Chark caught 66 passes for 1,351 yards and six touchdowns in four years with the Tigers. He had a career-high 40 receptions for 874 yards as the team’s top target in 2017. The speedy Chark also ranked second in the Southeastern Conference by averaging 10.6 yards a punt return. He finished his college career with 1,817 all-purpose yards. The Jaguars have six of their seven draft picks under contract. Only first-round defensive lineman Taven Bryan remains unsigned.